You know you’ve been busy when you check the last blog entry and it was for midsummer!!! We have driven the length and breadth of the country and we’re about to do it all over again! 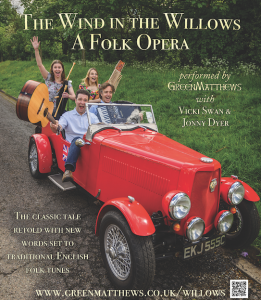 Almost exactly a year ago we started rehearsals for Wind in the Willows with our good friends Chris Green and Sophie Matthews and now we have started our little October tour. We’ve had such fun with Mole, Ratty, Toad and Badger and we really want to share it with you! So catch us somewhere this month!